With only 13 of 58 fourteeners done, I cherished any opportunity to bag more than one in a trip. 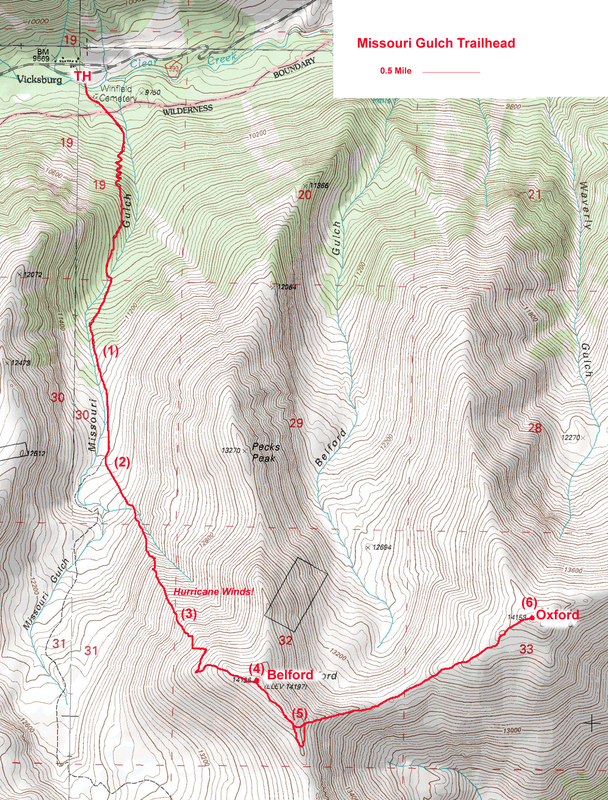 We were going to do a snow climb on Belford and then traverse over to Oxford. I loved the plan; but, sometimes, two is one too many. For these intermediate distant peaks, we generally prefer to camp at the trail head the night before to avoid having to get up at 1am. But my travel plans ruined it. I didn’t get home from a week in Detroit until 10pm on April 24, 1998; so, we couldn’t get to the Missouri Gulch until 3am. With a wake up call coming at 5am, I wouldn’t get much sleep or acclimatization for my first 14er of 1998. And then it snowed hard all night. We awoke to a fluffy start, and a quick elevation gain. The trail gets steep immediately as it switch-backs up through the trees (position #1 on map). The mountain was ours. No sign of humanity as far as the eye could see. It was a spectacular setting; almost enough to make me forget how tired I was. Almost. We took the northwest ridge route: 2000 feet straight up. It was sort of boring, really. And that was the last thing my sleep deprived mind could tolerate. I felt terrible (position #2). I was tired and dizzy, and the higher I climbed, the worse it got. Brian moved ahead while I struggled up the slope. Twice I nearly fell over backward and one time I fell asleep while taking a break. It was my worst performance ever (I mean ‘ever’ as in before or since). Since Brian wasn’t around, I couldn’t stop without telling him. So I kept plugging along, a few inches at a time. By the time I reached the summit, Brian had been sleeping on the large boulder for an hour. I felt badly about being so slow, but Brian’s first comment was “never give up, huh?”. It was too late to push onto Oxford; hell, I was lucky to get Belford (position #3). We started down, and I felt better immediately. With all the snow, I was glissading down the entire mountain. The first glissade was a real howler….snow flying up all around me as I flew down the slope. I came to a stop just before a steep couloir (position #4). Brian caught up to me and said he didn’t like the look of the snow. I said, “let’s find out”, and push myself down the chute. About 15 seconds in, the snow in the chute let go. But rather than throw my stupid bones down the mountain, the snow just ran out from under me and dumped me on the crusty snow layer underneath. It was a strange feeling watching the snow crash down the mountain; it could have been me with it. And with the good snow gone, the good glissades were over. Three hours of postholing (position #5) got me to the trees, and a short time later we reached the truck. We had taken 10 hours to climb 4,500′ of elevation in only 4 miles one-way (8 miles round trip). My feet of elevation per hour of sleep was at the high end of the human potential scale, in my opinion. Thank God that Brian drove. I couldn’t stay awake to save my life. We packed up our camp and piled into the truck. I fell asleep immediately, and slept for 2 hours while Brian drove. He woke me around Eisenhower Tunnel to help him navigate the whiteout he was driving in down I-70. The snow was falling so hard that we couldn’t see more than 10 feet, which is bad when driving at 30 miles per hour. My job was to watch the guard rail to warn Brian when he was drifting too far to the side of the road; he couldn’t afford to take his attention from the faint lights in front of him. Every 15 minutes or so, he’d pull off the road so I could run out and wipe the snow off the headlights. I don’t know how we avoided getting crushed by a blinded truck driver. It was completely insane, but at least I had a nap before hand. And with the success of this trip, Brian and I would go on a tear, bagging 5 14ers during the Spring of 1998. Unfortunately, Oxford wouldn’t fall until September 2000 on a trip with my wife. We didn’t have snow problems, but the wind was historic.